What I really want is some sort of mac-address based buddy list. 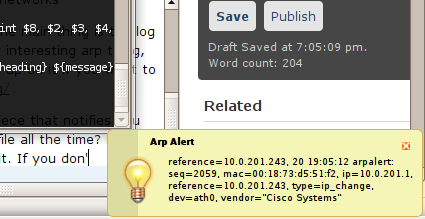 One that would show my a list of the mac addresses talking on my network, and allow me to alias them. That would be cool. I don’t think I’m done with it yet. (I want to make it give different time outs for different types of messages, and I want it to change the heading to something dynamic instead of the Arp Alert, but yea) So put that in a .sh and run it! Nothing may pop up! Try putting something new on the network and seeing if something shows up in the log. Its pretty easy to troubleshoot and modify to your liking.